Please note that the content of this book primarily consists of articles available from Wikipedia or other free sources online. 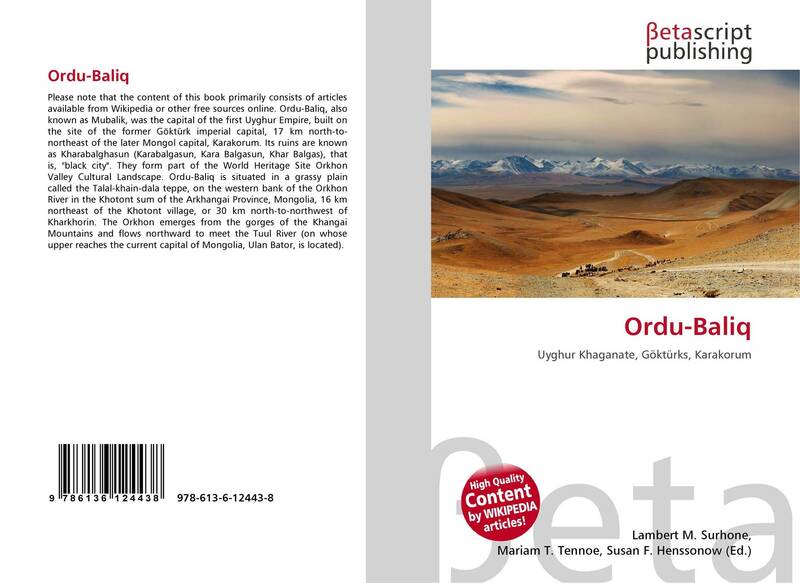 Ordu-Baliq, also known as Mubalik, was the capital of the first Uyghur Empire, built on the site of the former Göktürk imperial capital, 17 km north-to-northeast of the later Mongol capital, Karakorum. Its ruins are known as Kharabalghasun (Karabalgasun, Kara Balgasun, Khar Balgas), that is, "black city". They form part of the World Heritage Site Orkhon Valley Cultural Landscape. Ordu-Baliq is situated in a grassy plain called the Talal-khain-dala teppe, on the western bank of the Orkhon River in the Khotont sum of the Arkhangai Province, Mongolia, 16 km northeast of the Khotont village, or 30 km north-to-northwest of Kharkhorin. The Orkhon emerges from the gorges of the Khangai Mountains and flows northward to meet the Tuul River (on whose upper reaches the current capital of Mongolia, Ulan Bator, is located).